Let’s be honest: graphics wise, Achilles casino slot game by RTG online slots doesn’t offer much. In fact, it looks like it’s been made over a weekend using Microsoft Paint. This is a history-themed video slot game based on the famous Troy city and war, but you can hardly tell it. Although, this is also a medium variance game, which means the coin costs per spin are low but the payouts are big. Achilles online slot game by RTG may not look fancy, but it has a progressive jackpot pool and the payout values of its symbols are quite high. The game consists of 5 reels, 3 slots and 20 pay lines. There are four high-valued, six low-valued and two special symbols in the game. High valued ones are shown with pictures of the Trojan horse, a pennant, a shield and the portrait of Helen. The payout range of these symbols is in between 30 to 5.000 coins. The portrait of Achilles is used for the wild symbol. It substitutes all other symbols (except scatter) and pays 10.000 coins if you receive five of them. The wild symbol has one more feature: when three (or more) wilds appear anywhere on reels, a bonus round is triggered and you are asked to choose between three Achilles portraits. Depending on your choice, you are awarded 15, 20 or 25 free spins. During these free spins, all scatter symbols on reels turn into wild and the multiplier values raise up to x3. As for the scatter symbol, it is shown with a picture of the famous city, Troy. You get 10 free spins with x2 multiplier values when you land three scatters anywhere on reels. 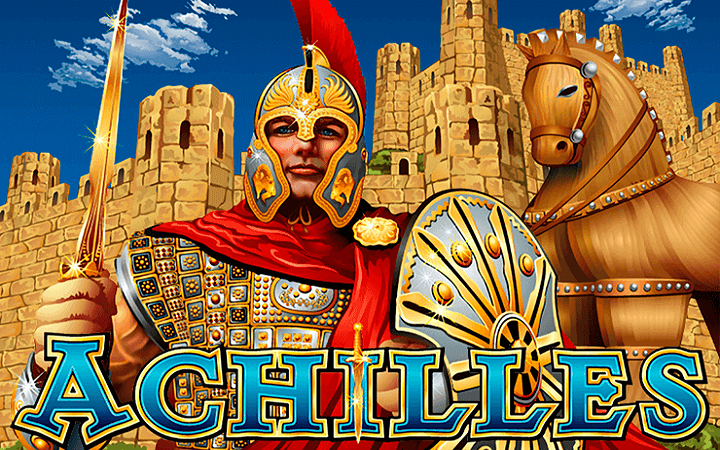 Free spins and multipliers – that’s the specialty of Achilles. In other words, if you like to play casino slots online, you may not like the looks but you are going to love the features of the game. You can set the bet levels between 0.20 and 5.00 coins; the maximum bet value is also 5.00 coins. Winning progressive jackpot pool is random and can happen anytime. The free slots no download version of the game will tell you everything you need to know, but we recommend trying this one at least for one time.